Risperdal has been at the center of numerous Risperdal gynecomastia lawsuit or otherwise known as Risperdal male breast growth. Risperdal has recently been linked to several serious side effects, including the significantly troubling side effect of gynecomastia, a condition that causes male patients to develop or grow breasts. While generally caused by either hormone imbalance or certain health conditions, Risperdal Gynecomastia lawsuits filed against JJ alleging that the drug causes an increase in the levels of the lactation hormone prolactin, which stimulates breast growth development. Alonso Krangle LLP is investigating Risperdal gynecomastia lawsuits on behalf of boys who have developed male breasts, or gynecomastia due to Risperdal or Risperidone. For a FREE Risperdal gynecomastia lawsuit evaluation, please fill out our online form, or call 1-888-836-3050. The defective drug law firm of Alonso Krangle LLP is currently investigating potential Risperdal male breast growth gynecomastia lawsuit claims on behalf of individuals who have suffered serious Risperdal male breast growth, gynecomastia side effects. Many Risperdal ( gynecomastia ) male breast growth, side effect victims or their loved ones have already filed Risperdal male breast growth, ( gynecomastia ) side effect lawsuits alleging Johnson Johnson subsidiary Janssen failed to adequately warn of serious Risperdal gynecomastia side effects, including male breast enlargement. 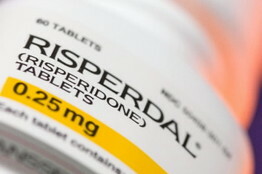 Risperidone, manufactured by Johnson Johnson and sold as Risperdal, is an antipsychotic drug that was first approved by the U.S. Food and Drug Administration (FDA) in 1993, and is used as a treatment for schizophrenia, mania, and irritability associated with autistic disorder in children and teen agers. Risperdal belongs to a class of drugs known as atypical antipsychotics, and works by altering certain substances in the brain. Recently, lawsuits have been filed against the pharmaceutical giant alleging the company failed to warn physicians and patients about the increased risk of gynecomastia, especially in young, developing boys. Some of the victims have been forced to undergo mastectomies because of the size of their breasts. One such lawsuit, filed in Philadelphia involves a 21-year-old man who alleged that a Risperdal side effect caused him to develop breasts after he took the drug for about five years starting at the age of nine. The man said in the complaint that he suffered psychological trauma because of the Risperdal breast growth side effects of the drug and had to have his breasts surgically removed. Last September, JJ settled that case under confidential terms just as the trial was about to begin. Hundreds of Risperdal gynecomastia, male breast growth, lawsuits have been reportedly filed against JJ and its subsidiary Janssen. Mental health physicians report that gynecomastia or male breasts, can have a significantly harmful mental and emotional effect on boys and young men, often causing shame and humiliation and deep self-hatred. The emotional scars may last well past any surgical remedies as boys may be severely taunted by their peers and suffer emotional trauma when trying to engage in normal activities. In the past year alone, Johnson Johnson has paid billions in fines over Risperdal. In fact, JJ was fined $1.2 billion by an Arkansas jury for downplaying the risks associated with Risperdal. Months later the pharmaceutical giant paid $181 million to 36 states to settle allegations that it promoted Risperdal for non-FDA approved uses, and agreed to pay $2.2 billion to the U.S. to settle illegal marketing probes. If you or someone you love has experienced serious Risperdal side effects like gynecomastia, male breast growth, while taking the antipsychotic medication, the defective drug attorneys at Alonso Krangle LLP would like to talk with you. For a FREE Risperdal male breast growth gynecomastia lawsuit evaluation, please fill out our online form, or call us.